If you are ready to start your home buying process, you couldn’t be in better hands than you are at The Riverfront. 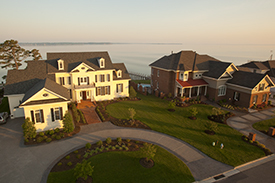 A collection of imaginative homes are being built by a carefully selected group of Hampton Roads’ finest builders. You can choose from a wide variety of styles and floorplans all of which feature the latest innovations in new home construction. We are proud to have the following featured builders for you to choose from in The Riverfront. I would like more information on the Builders at The Riverfront and the process of building a custom home.